The D-31 class of medium cruiser was originally intended as the great hope for the empire. But even the many design changes and stringent construction specifications would propel the D-31 from grand design to unexpected workhorse. The D-31 was originally envisioned by the Restrak line as a replacement for the D-7. The Drell corporation had rigidly held onto the use of the bulky KWE drive system on the popular battlecruiser. 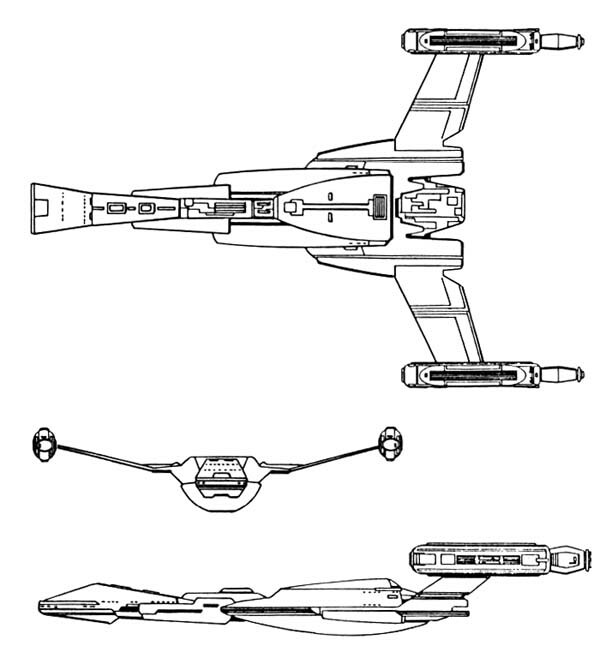 Many had complained that the larger reactant chamber and bulky warp coils did not give the D-7 a spacious enough interior for heavier weapons and expansion. But Drell would not be swayed, despite pressure from several houses and High Council Members. So engineers from the Restrak line contracted to begin production on a new design created from a desire to improve the fleet. The Death Boot was named after an insult given by a Federation commander to a Klingon commander during a tense boarder standoff. The Federation commander, exasperated by his inability to act, finally hurled the insult “you mother wears army boots,” from old earth legend. Totally missing the insult, the Klingon commander bespoke of the incident upon his return to his home. Several of his line brothers, better versed in human insults, explained the innuendo. Rather than be offended, the Captain immediately said that the name would be perfect for their new design, and the Death Boot was born. The A went through several changes before actual production was begun. The original design was for a class X heavy cruiser that was cost efficient enough to be mass produced. But by mid 2275, yard officials at the production center announced that the desired vessel was not viable. With time quickly running out, engineers finally reduced the size still further and moved the wing structures into an open upward position to provide space for loading bays and engineering systems. Although much less powerful than originally envisioned, the Death Boot was still a powerful and capable ship. Within weeks of a test launch, it was discovered that the D-31’s hull was stronger and roomier than the D-7. Nearly as combat capable as the D-7, the D-31 significantly out-classed the older Drell design by using the new and powerful Vitrien KSL trinary shielding system. With more power for weapons and maneuvering, the D-31 would have a profound effect on other designs within the Empire. But the A was not with out its flaws. The roomy interior of some decks starkly contrasted with above average cramped living spaces. Dozens of safety redundancy features ran right through the middle of the ship, reducing internal spaces. The decision to embark over 240 ground troops and their support systems pushed design limits beyond recommended levels. Although successfully approved for nearly 240 space frames, production was canceled after only 84 were completed. The B, launched the next year, helped to some degree, replacing the dual KP-5’s with a single KP-6, but had little difference with the A. B production was also halted early, after only 54 ships were launched. Surprising, it would be the Drell Corporation who would re-ignite the D-31 program twelve years later by launching a C version, early in 2288. The C removed the entire marine compliment and their support systems in favor of lab spaces and roomier quarters. The C would immediately rocket to front of design considerations, and by mid-2288, Drell had purchased the construction contract from Restrac and was in full swing production of the D-31. The C increased disruptor power, doubled the number of torpedo tubes and increased the impulse drive output, as well as adding 9 new science labs. This gave the cruiser the ability to operate as an exploration vessel as well as a combat cruiser. D-31C’s were immediately sent to the frontier, expanding the boarders by leaps and bounds. With only a few clashed with Federation forces, the D-31’s were able to hold their own and in one instance, destroyed a Federation Heavy Cruiser. The D-31 new found status was tenuous to say the least. By 2290, nearly a dozen had gone missing, and twice as many had been destroyed or scrapped after combats with Romulan forces or unknown vessels along the boarders. Soon after, the program would almost be canceled with the destruction of Praxis. Like most starship construction programs, the destruction of Praxis severely cut the D-31 program. Over two dozen construction programs were canceled to free up funds and materials now desperately needed for the home world. Construction of the D-21 was cut from nearly 15 ships per year to just 2, and by 2294, the program was put in mothballs all together. It was not until the following year, as the High Command began to expand the fleet once again that the D-31 was re-examined. Armed with a new shield system and a more powerful torpedo system, the D-31D was easy enough to produce, yet hardy enough to remain viable as a combat platform. Of the 354 D-31’s built or converted, 79 G models remain in active service, although most are scheduled for replacement over the next 5 years. 1 A, 2 Bs, 1 D and 3 Gs are listed as missing; 4 As, 2 Bs, 5 Cs 3 Ds 2 Es 4 Fs and 39 Gs have been destroyed. 1 A, 1 C, 1 D, 1 F and 8 Gs have been scrapped; 1 A has been captured by Star Fleet, 1 C has been captured by the Romulans and 3 Gs have been captured by Dominion forces. 5 As were sold to the Romulans, 5 As were traded to the Orions and 5 to the Naussicans. 10 As, 30 Cs 25Ds and 98 Gs are in reserve fleets. 3 As, 2 Bs and 9 Es have been sold to ranking families in the empire. Power Units Available – 16 ea. 16 ea. 18 ea. 18 ea. 18 ea. 18 ea. 18 ea.